Below Blond:ish’s slick grooves, there has always been more at work. In fact the Canadian duo, comprised of Anstascia D’Elene Corniere and Vivie-Ann Bakos, is known for the lush, psychedelic undercurrents in their music. The origins of those more experimental tones become quite clear with a look at their all time top 10 tunes, which they have carefully selected and commented on for us just in time before the release of their debut album Welcome To The Present through Kompakt this Friday. 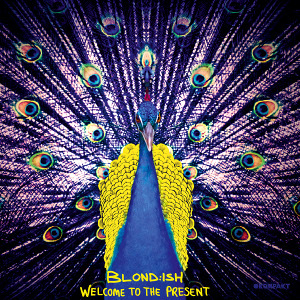 Just like the peacock adorning the cover of Blond:ish’s spaced out LP, it’s a colourful affair, to say the least. Vivie-Ann: This guy is a legend. This track reminds me of 1999, when I was a super pubescent, innocent raver. At the peak of the party, everyone was on one vibe to this! To this day, I still play it when the vibe is just right. When you can produce a track that is loopable all night long under everything else, or leave it playing for 30 minutes, and then “waaaaait for it”… Respect! Vivie-Ann: In a past life I must have been in this time as well, because I feel completely connected to all of the experimentation that the Krautrock era brought about after the bubbly music of the late 60s! This track is a staple in my playlist, but the whole genre is endlessly inspiring. If you have creative writer’s block, just listen to some Krautrock! The weirder and more strung out, the better! Vivie-Ann: It’s hard to pick one record from Thomas Melchior as he’s a genius in my opinion. He knows how to use a subtle female hypnotic haunting voice to perfection. His Cinderfella LTD project and Soul Capsule are also worth noting! This guy speaks my language, he uses a lot of references to meditation, om, Eastern practices, etc. I would love to know if there’s deeper meaning of them, or the science behind the music. Vivie-Ann: Haha, because libras are the best… Nah, he is my hero because I love his laugh and because one day I hope to just get lost in frequencies and cymatic experiments in a bunker in the jungle like he’s doing and just make paradise music. I can completely see music and more, sound being interdimensional! Google “cymatics”. It’s the science of seeing sound through a medium. After you look it up, let’s talk. Vivie-Ann: This was one of the tracks in my dad’s record collection from which I first got my inspiration. It brings back incredible memories. I would steal my mom’s sewing needles and spin them on my dad’s records. It’s a silly track, but it makes me dance, and that very few tracks can do! This track triggers something that I can’t explain. Play this at any house party and I’ll be the life of it. Guaranteed! Anstascia: For me, this is an epic Burning Man-ish classic which I never want to end. A mindfuck of a record. Dominik’s minimal journey take on it really gets super tangled, like a really good thriller in which you never see the twisted ending coming, but then it hits you from all sides. The modulated vocals should also be mentioned, they could twist some circuits in your brain, permanently. Anstascia: This is a fairly new discovery for me. It’s part of my “commercial” Indian music collection. Viv calls it “commercial” Indian as a joke because I’ve been playing it so often that it’s become commercial to us, lol. We were recently exploring our inner selves in India and this was the theme song which really made a huge positive change and impact in our lives that we’re gutting deeper into more each day. Vivie-Ann: This is a super nostalgic track in my family …I even played it to my sister just before she got walked down the aisle at her wedding. This track also reminds me of the time when Moby gave a speech at a festival in California at Lightning in a Bottle. It was about sound healing and music therapy and how a nostalgic track to a patient with alzheimers can help with dementia…Turning point most definitely.